Half way through the VI Malta International Music Festival Alan Chircop, Artistic Director of the European Foundation for the Support of Culture, organising the Festival and Artistic Director of the Festival, welcomed the audience and introduced the evening’s concert. The main work of the concert is a new composition by Alexey Shor “Images of the Great Siege” which is being performed by the joint forces of the Malta Philharmonic Orchestra and the Armenian State Symphony Orchestra. The work was specially commissioned for the present Festival. 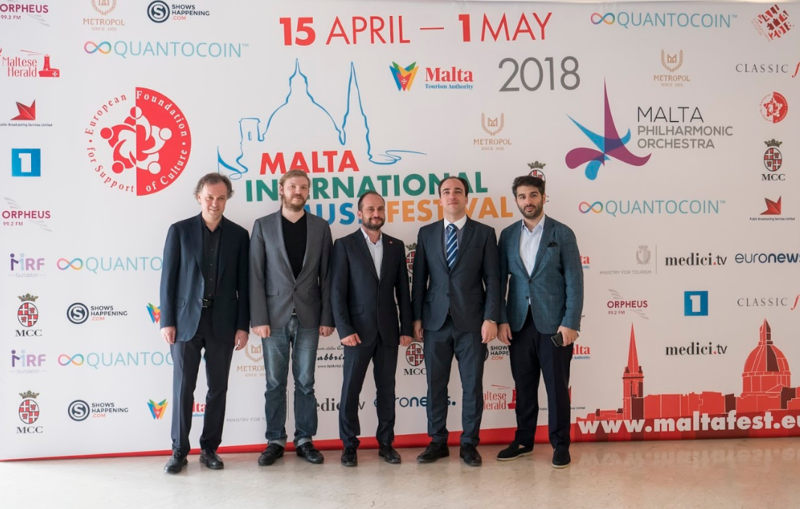 It started life as a composition for piano which constituted the set piece for the second round of this year’s Malta International Piano Competition which is being held concurrently with the Festival. It was then developed into a full scale symphonic cycle made up of 13 sections. With titles such as ‘Cannons’, ‘St Elmo’, ‘Horse Riders’ and ‘Victory’ this is programme music relating an event and arousing emotions about it. 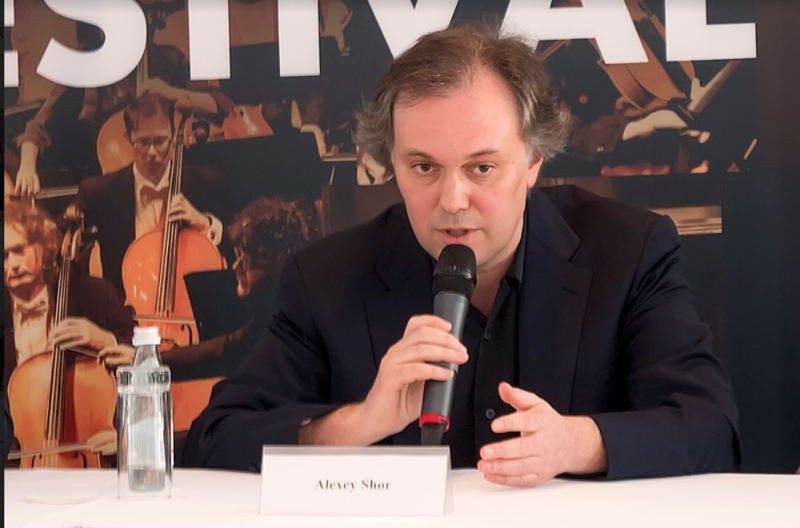 Alexey Shor said that he was surprised that the topic of the Great Siege of 1565 had not been tackled by composers since it is a fantastic story. In the course of composing the piece he had learnt a lot about the events of the Siege and his pieces refer to specific events and places such as the Palace of the Grand Masters, which he considers to be a fascinating place that should be visited by anybody coming to Malta for the first time. The performance will be enhanced by images projected at the back to explain the narrative of the music. Khachaturian’s music from his worldwide well-known ballet Spartacus is also on the programme of the concert. 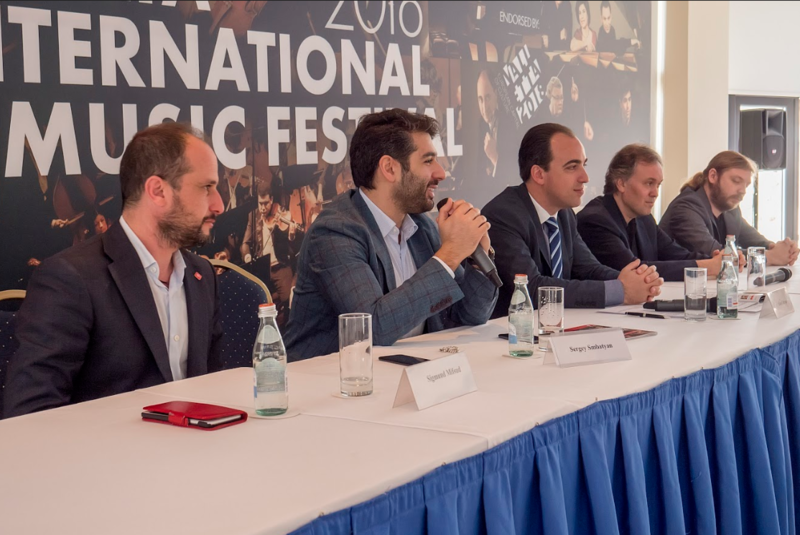 Present for the press-conference was Sergey Smbatyan, conductor of the Armenian State Symphony Orchestra, who is conducting the evening’s performance. He said that getting the two orchestras together is an amazing project though not an easy one since each orchestra has its own musical language. He is looking forward to the result. He believes that the joint orchestras give new colours and new emotions to the performance. The composition uses the two orchestras as one unit and not as two separate units. Asked about the effect of the harrowing schedule on the orchestra and especially on him as the person in charge of the overall performance he said that both he and the orchestra are excited about the whole project, not just the performances but also meeting so many eminent artists for the first time and discussing the works with them which is an emotional experience. Besides the whole atmosphere of the Festival is imbued with an energy that transmits itself to the orchestra. . It is their first experience of such a project but they are ready for it. 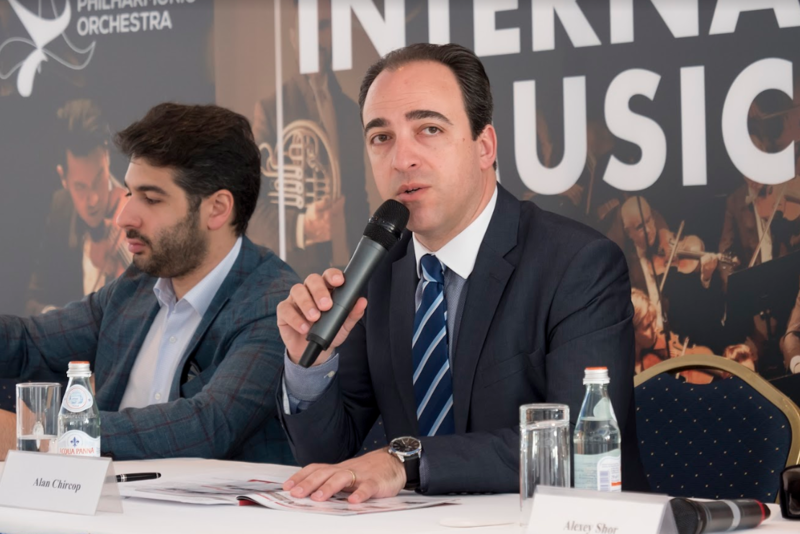 Asked about past experiences with the Malta Philharmonic Orchestra Smbatyan said that this is the fourth time that he is conducting the orchestra. He finds working with new orchestras very exciting. The conductor expresses his emotions and the musicians understand this: that is how the machine works. He thanked Sigmund Mifsud, Chairman of the Malta Philharmonic Orchestra, who was also present for the conference, for giving him this opportunity to work with the MPO. In reply Mr Mifsud said that Orchestra is happy to collaborate with Smbatyan and that the vision for the MPO includes working with foreign conductors which he finds very enriching and he hoped that there would be further collaboration with the Armenian orchestra. The Orchestra had on a number of occasions included guests from other orchestras in its performances but it had never played with another full orchestra. 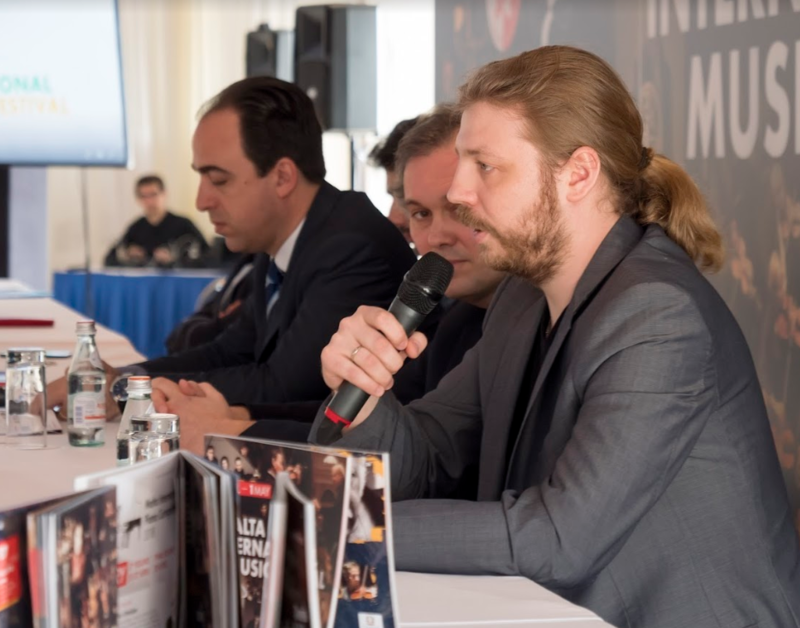 Also present at the conference was pianist Denis Kozhukhin who the following day would be premiering together with the Armenian State Symphony Orchestra another work by Shor – “Travel Notebook”. A short video feature showing the artist at the piano followed the introduction of Kozhukhin by Alan Chircop. Kozhukhin is prize-winner of the Queen Elisabeth Competition based in Brussels. Asked what he thought of the work he would be performing Kozhukhin said that he felt that this was a special occasion for him because he was sitting next to the composer of a work that he enjoys playing so much – a powerful work that with its different moods he found very exciting from the very start. He found particularly interesting the fact that in composition, although it is listed as a ‘Concerto for Piano and Orchestra’ does not feature the piano as protagonist but as part of the ensemble, more in the nature of chamber music. He is looking forward to the performance and is grateful for the opportunity to participate in the Festival which is an important event for him especially because of the people he has met some of whom are old friends. In conclusion Alan Chircop gave a short overview of the rest of the Festival. He said that the piano competition had entered its second phase when candidates have to present a 50 minute programme that includes the piano version of Shor’s composition “Images of the Great Siege.” A new panel of judges, made up of top people from the piano world, under the chairmanship of Constantin Orbelian was in attendance. He was happy to be greeting a number of great performers who will be arriving the coming week to perform in the various concerts. The Festival will come to an end on the first of May with a grand orchestral concert featuring music by Charles Camilleri, Prokofiev, Penderecki and Shor. Finally he thanked all the participants at the press conference and invited them to the next day’s press briefing.